Four research efforts pushing the limits of magnetics technology are among 40 new projects recently funded as part of OPEN 2018, the Advanced Research Projects Agency-Energy’s (ARPAE) latest open funding opportunity. One seeks to break new ground in advanced core materials for transformers, another aims to increase power density of electric motors while reducing weight and the third seeks to develop miniaturized nuclear magnetic resonance for oil and gas exploration by using gallium-nitride (GaN) circuitry. 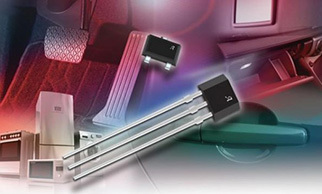 GaN is widely seen as the material of the future for semiconductors rather than silicon. 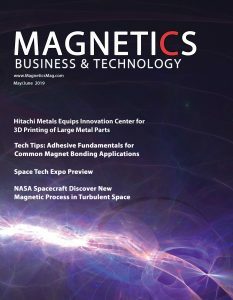 The fourth project, by AML Superconductivity & Magnetics on contact-free current transfer in motors and generators, was previously reported in the January/February issue of Magnetics Magazine so is not covered here. Funded for $1.2 million, Sandia National Laboratories in Albuquerque, NM will seek to develop advanced core materials for grid-level electrical transformers, improving efficiency and resiliency. Current transformers feature copper windings surrounding a magnetic core that amplifies the magnetic field generated by the coil, but at the expense of energy losses. The project team’s new core material seeks to increase electrical efficiency by at least 10% while enabling a 50% reduction in transformer size. The core will be robust, withstanding electromagnetic pulses (EMPs) and geo-magnetic disturbances (GMDs) that threaten today’s grid. Sandia will also develop a revolutionary polymer additive for transformer oil that transitions to a heat-conducting solid at high temperatures. This polymer can be added to existing transformers as a retrofit and included in new transformer oil. By dramatically increasing heat conduction away from transformer windings during high-current events, the resiliency of transformers to EMP and GMD will be increased. 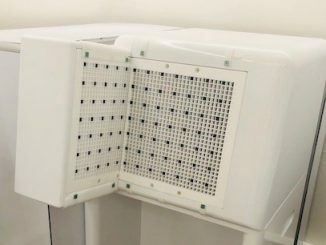 Funded for $2.9 million, Georgia Tech will seek to develop a new approach to internally cool permanent magnet motors. The technology could dramatically improve electric motors’ power density and reduce system size and weight. To do so, the team will integrate the motor and drive electronics into a unique system packaging incorporating an embedded advanced thermal management system. They will also develop wide bandgap power electronics packaging to enable high-power density operations at higher temperature. The new design could substantially increase the power and torque density above the state of the art and enable more energy-efficient electric trucks, buses, and, potentially, aircraft. Aided by $1,7 million in new DOE funds, Harvard University plans to develop miniaturized nuclear magnetic resonance (NMR) electronics to provide detailed information on composition and environment in subsurface oil exploration and production. NMR is most commonly found in magnetic resonance imaging machines, and the electronics are extremely large and unwieldy to apply to field use. The system combines the GaN circuits and a permanent magnet. By building their device with gallium-nitride-based circuitry, the team seeks to greatly miniaturize the system and enable it to withstand the high temperatures found in a deep drill hole. As a smaller system, it can be far more broadly disseminated throughout geological formation, enabling long-term distributed imaging of Earth’s surface and transforming oil discovery and production across mature fields, deep water fields and unconventional petroleum resevoirs. The Harvard lab is now developing a miniature NMR system to image subsurface rock formations for oil and gas exploration using gallium nitride technology rather than silicon technology. 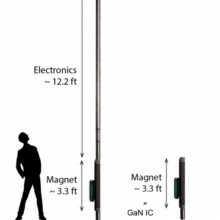 The device aims to shrink current NMR devices from about 15 ft to about 3ft. 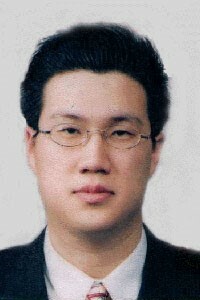 The principal researcher is Donhee Ham, professor of electrical engineering and applied physics at Harvard. NMR is a technique that perturbs protons within a molecule to glean important clues about its structure and motion. It can identify unknown substances, detect very slight variations in chemical composition with atomic resolution, and measure how molecules move and interact, making it an essential tool in organic chemistry, structural biology, and drug discovery, explained Ham. Since the 1990s, NMR has been a vital tool for petroleum exploration in the oil and gas industry. It is used to examine fluid compositions as well as molecular interactions between rock surfaces and fluids and has helped discover large oil and shale reservoirs in Brazil and the United States. However, current NMR electronics used in oil and gas discovery are bulky, heavy and expensive. They stand more than 12 feet tall and weigh more than 200 pounds. Ham and his team are looking to change that by integrating the bulky NMR electronics into a semiconductor chip that can be held at the palm of a hand. The new challenge for deep subsurface applications is making chip-scale electronics that can withstand the high temperatures of the subterranean environment. Current generation silicon integrated circuits are not cut out for such high-temperature applications. To overcome this challenge, Ham and his team will be using GaN integrated circuit technology, which not only aids in miniaturization but also allows the system to operate in high temperatures. In addition to subsurface oil and gas discovery, this miniature NMR device could be widely distributed to monitor quality and improve efficiency in downstream elements of the energy chain, including shipping, pipelining, mixing, refinery, storage, and distribution. The research is also part of a continued collaboration with Schlumberger, one of the world’s largest oilfield services companies. 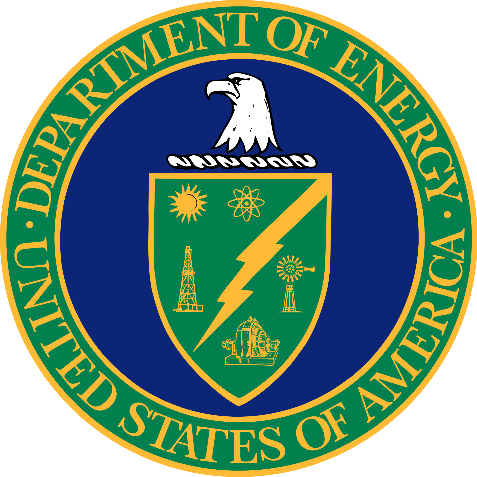 The DOE’s OPEN solicitations are an open call to scientists and engineers for transformational technologies across the entire scope of ARPA-E’s energy mission. The selected OPEN 2018 projects are in 21 states and fall into 9 technical categories, including transportation, electricity generation and delivery, and energy efficiency. Of those selected, approximately 43% of OPEN 2018 projects will be led by universities, 35% by small businesses, and the remainder by large businesses, non-profit organizations or federally funded research and development centers. More projects are in the works as OPEN applications have seeded other small new program areas that ARPA-E is continuing to roll out.